You are here: Home / Movies / Bambi FLASH Giveaway – 10 WINNERS! Bambi FLASH Giveaway – 10 WINNERS! WE have 10 FREE Bambi Digital downloads for 10 lucky winners! We ask that you enter the giveaway by THIS evening! We will be picking the winners really soon!!!! This is to celebrate the Bambi release! Digital download codes are awesome since they can just link right into your Disney Movies Anywhere and even your iTunes account! You can download OR stream them! Enter the rafflecopter form below for a chance to WIN! Disney’s Bambi, which celebrates its 75th anniversary this year, joins the Walt Disney Signature Collection. The Collection release includes a variety of new bonus material, including recordings of Walt Disney discussing the challenges and triumphs during the production of “Bambi;” deleted scenes and characters; stories and effects that “Bambi” had on the Studio, other films and artists; and much, much more. Additionally, the Digital HD release includes an exclusive, heartfelt feature on the incredible artist, Tyrus Wong, who inspired the film’s soft watercolor backgrounds and beautiful palette. 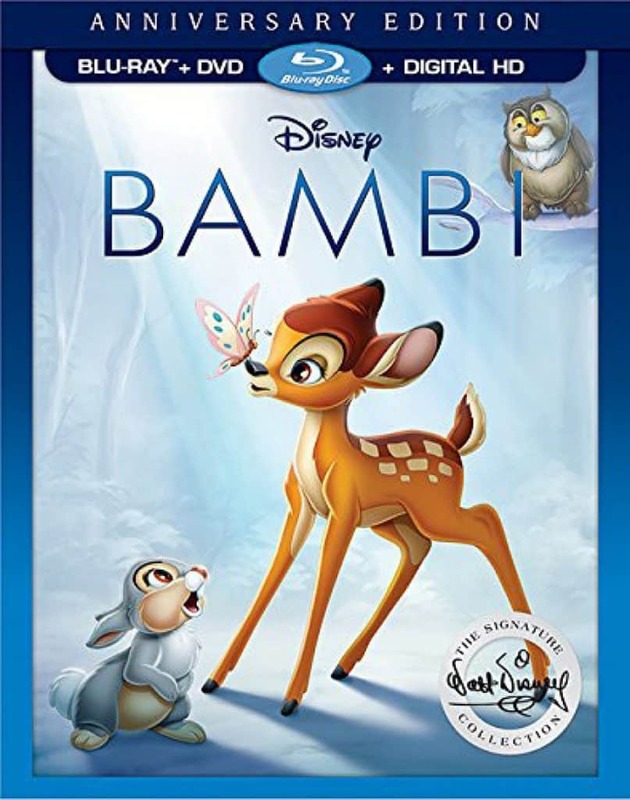 Bambi arrives home on Digital HD and Disney Movies Anywhere on May 23, and on Blu-ray™, DVD and On-Demand on June 6. Yes, we download movies all the time! The last one was A Dog’s Purpose. I have not downloaded movies. I have not purchased a downloaded movie. Yes, we download movies. I can’t remember the last one, but they are always family movies. I love Bambi! I haven’t seen this in years! I have never downloaded any movies. I either buy them from the store or I rent them. I don’t download movies. I usually stream them online. Yes i have, the last movie i purchased as a download was Cars 2 for my children! Yes, we recently downloaded Moana. I have not downloaded movies before. I think the last movie I downloaded was Wreck it Ralph for my son. Yes I have , usually buy one for movie nights . Somethings for a snowday or rainday. I haven’t purchased a download movie yet. We usually buy the blurry with digital copy because they don’t always transfer over from Xbox to vudu for us, but the last one we boUght digitally wasjohn wick 2. Yes! I added the Pirates of the Caribbean collection this weekend since they were on sale. I have never dowloaded a movie. I have downloaded movies before. I think the last digital movie I purchased was Sing. i have purchased a few downloaded movies! just recently we purchased the secret life of pets! Yes! Last one I downloaded/purchased was A Dogs Purpose just a few days ago!! No, I haven’t ever downloaded movies before, but my kid’s have for school. remember seeing this as a child , would be great seeing it again . The last movie I downloaded was Jurassic World for my grandson on his iPad. No, I haven’t downloaded any but I love finding out that the code can be used with iTunes! I have recently found the joy of downloading movies. Im currently addicted to Vudu. The last one I downloaded was Get Out. I haven’t before, so i’d need instructions LOL. We usually have DVDs or netflix. Yes I have and the last one downloaded was trolls. no never downloaded a movie. Yes, I’ve downloaded many movies — Rockdog is the most recent. I have only downloaded one movie and it was “Jurassic Park”. Descendants was the last movie we downloaded. I haven’t purchased digital movies by themselves but I have used the codes included with dvds to download on devices. The last one I downloaded was a Monster High one…don’t know which one though. I usually download to rent rather than own. The last movie I downloaded was Jackie. The last movie we downloaded was the Lego Batman movie. We download movies occasionally. My son usually downloads the movies for me. I think Sing was the last one we downloaded for my granddaughters!! I love watching the classic Disney movies with them!! No I have not downloaded a movie before. I have not down loaded a movie before. Never downloaded a movie. Behind the times! I don’t download but I would like to learn how to. No I haven’t downloaded movies I guess I should start. I have not downloaded movies. I don’t know how. Yes, I’ve downloaded movies. The last one I purchased was Star Wars. No I don’t download movies. I’ve never purchased a download movie bur an excited about that option. Perfect way to get some new movies instantly when the grandkids are here. Ive purchased downloaded movies. The last movie that I downloaded was Angry Birds. Thanks for the giveaway. I hope that I win. No, I haven’t downloaded movies. My son in law downloads my movies for me. He has a Vudu account that we share. Last one I downloaded was the secret lives of pets! I haven’t downloaded, but I have bought and streamed many! I purchased Barbie Starlight Adventure for my daughter. The last movie I bought was Secret Life of Pets. We have downloaded TV series, but no movies yet. I’ve never downloaded a movie before. I buy digital movies all the time and love the option. My last one was Split. I just downloaded A Dog’s Purpose.